1. 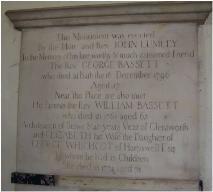 Henry BASSETT, son of Richard BASSETT of Glentworth (1744-1805) and Martha ARMITAGE ( - ), was born in 1778. He was baptised on 12 April 1778. He died on 1 May 1852. "Bassett, John Fardell: son of Rev. Henry Bassett, vicar of Glentworth, Lincs. Born there. School, Louth. Admitted pensioner, Jan. 27, 1846. Age 19. B.A. 1850. Ordained deacon (Linc.) 1850: priest (do.) 1851. Curate of Willoughton, Lincs. 1850-8. Vicar of Normanby, and Glentham, 1858-94. R.D. of Aslackhoe, 1883. Died March 5, 1894." From Biographical History of Gonville and Caius College. Does this entry refer to this Henry?? 2. Richard BASSETT of Glentworth, son of the Venerable William BASSETT Archdeacon of Stow, Lincoln and Elizabeth WHICHCOT, was born on 15 September 1744 in Glentworth. He was a Gentleman, Soldier. He married Martha ARMITAGE on 1 July 1774. He died on 12 July 1805 in Glentworth. He was buried on 17 July 1805 in Glentworth. He married Mary UNK. 4. the Venerable William BASSETT Archdeacon of Stow, Lincoln, son of Revd. William BASSETT and Lydia ADDERLY, was born on 7 June 1703. He was a Clergyman. He married Elizabeth WHICHCOT on [Julian] 19 February 1729 in Glentworth, Lincs.. He died in 1765. He was buried on 13 July 1765 in Glentworth. 6. Joseph ARMITAGE of High Royd, Huddersfield has few details recorded about him.